A La Porte City vigil for Jake Wilson. 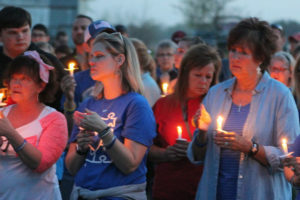 As the search for a missing college student continues in central Iowa, a Waterloo-based advocacy group that works to prevent child abuse and strengthen families plans a candlelight vigil tonight. The Family and Children’s Council of Black Hawk County is holding the community event at the RiverLoop Amphitheatre in downtown Waterloo, starting at 7 p.m. Hundreds of people are expected to come together in a show of support for 20-year-old Mollie Tibbets of Brooklyn and for Jake Wilson, the 16-year-old with autism who disappeared from La Porte City on April 7th. The group held a vigil for Wilson earlier this year. The event is also being held to support Kaiden Estling of Maynard, the 14-year-old killed in a hit-and-run accident in Fayette County in June, and Evansdale cousins Elizabeth Collins and Lyric Cook-Morrissey, whose 2013 kidnappings and murders remain unsolved. Collins would have celebrated her 15th birthday Tuesday. Organizers say the candlelight vigil will conclude with dozens of sky latterns being launched over the Cedar River.